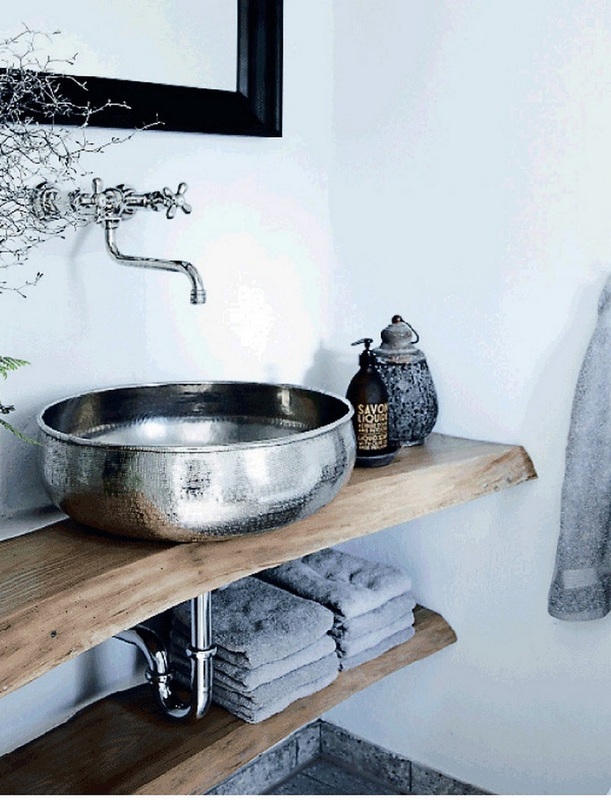 As a bathroom design element, floating vanities are certainly having their time in the sun. Wall mounted and suspended above floor level, they can have a significant impact in both small and large bathrooms by adding a sense of space. 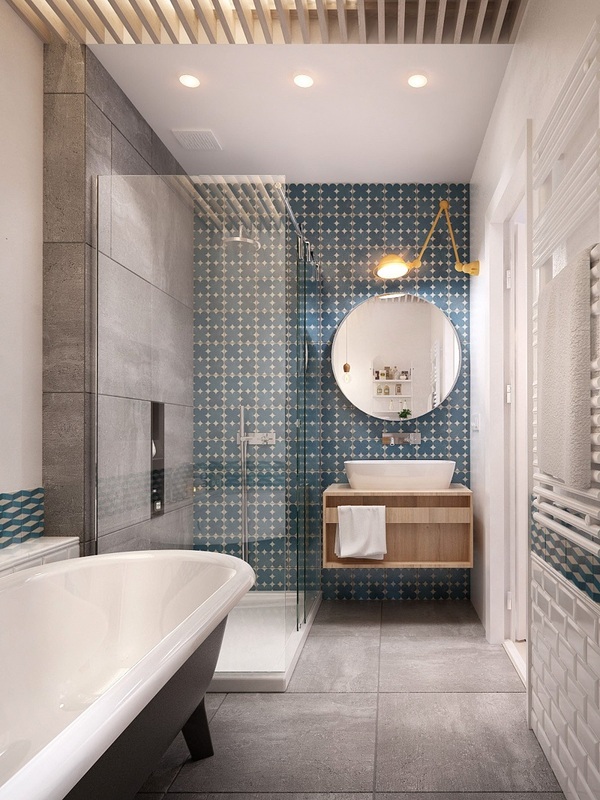 With this style of vanity it is better if the plumbing components go into the wall as opposed to down to the floor, although some embrace exposed drainage pipes as part of an overall look. 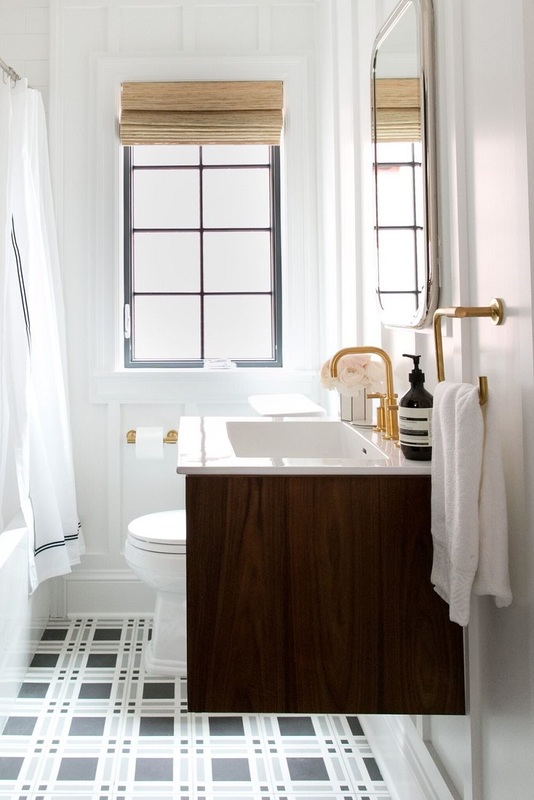 Unless exposed or hidden inside the wall behind the vanity, necessary waterworks will always restrict the amount of storage you have in the cabinet or skirt underneath the basin. 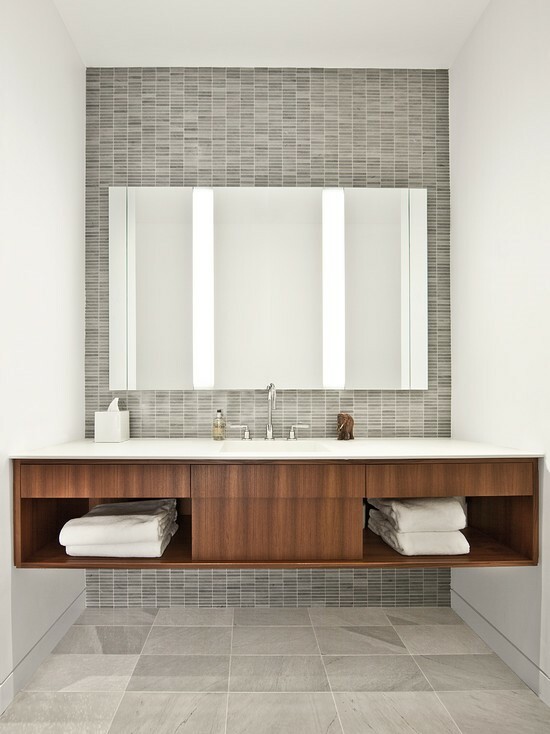 The more floor space you can see in a room the larger it will feel, and because a floating vanity is attached to the wall, floor designs don’t have to end at the base of the cabinet. This is a huge advantage if you are making the floor a focal point in the room, are installing radiant floor heating or want to make cleaning the bathroom easier. 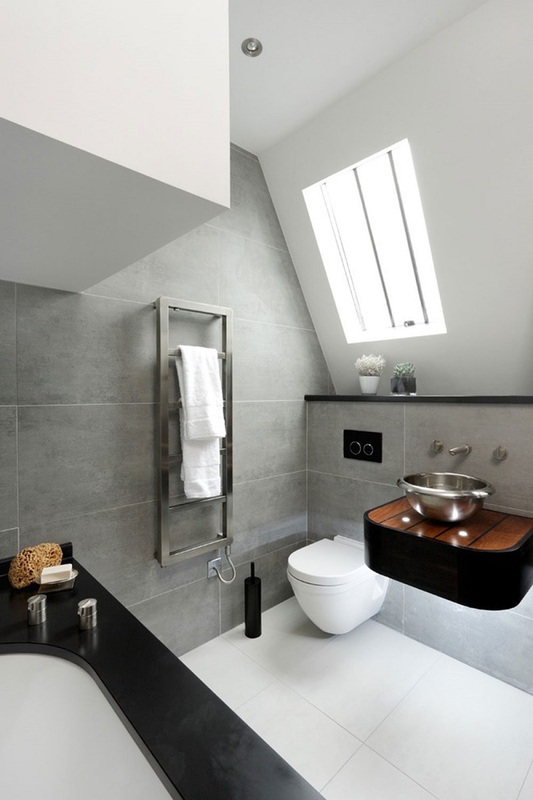 Storage is just as important in the bathroom as it is in any other room of the house, and when a floating vanity comes into play it’s fair to question its ability to provide storage options rather than take them away. Try drawers underneath your vanity top with a shelf lower down to pack in more storage without bulking out with solid cabinetry. The shelf can hold storage baskets or towels so everything you need is visible and within reach. If you have a family or controlling mess is a challenge, then a full-width open shelf might not be for you – in which case a mix of open and closed storage might work better. Curved corners on a floating vanity can be great in smaller spaces, since they protrude that little bit less into the area around them. A semi-recessed basin spilling over the front of a floating vanity adds an extra sense of spaciousness; however, you lose storage opportunities directly underneath and usually put the bottle trap on display. 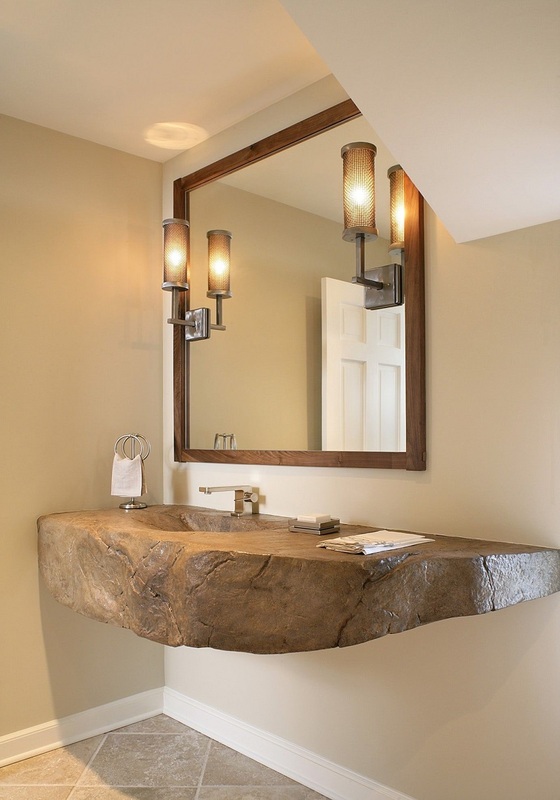 If you don’t have a solid enough wall upon which to anchor a floating vanity you can still gain the airy feel by using thin legs for additional support. An all-in-one basin-meets-vanity-shelf works best in bathrooms where there is storage elsewhere, so the extended surface is purely aesthetic. With a towel rail, this style is great for a guest bathroom. These are just a few of the different types of floating vanity, so before deciding on which one is right for you, ensure you have fully considered what you need it to achieve, but if done well, the sky is the limit. For more bathroom trends, design ideas and advice, or any other renovating projects you have coming up, make sure you visit the Auckland Home Show, 5 – 9 September 2018 at ASB Showgrounds, Greenlane, to get free expert advice and design guidance from more than 500 leading industry experts and suppliers. See www.aucklandhomeshow.co.nz for more info!